Summer is finally here! It’s time to warm up from the winter and spring season and get your summer nails on. This is why we found 35 of the best summer nails. These summer nails are so hot right now! When it comes to summer nails, you need to make sure your finger and toes are done to perfection. This season you are typically wearing your favorite flip flops or even your favorite open toed heels. This is why your toenails are just as important as your fingernails for the summertime. We hope the 35 best summer nails below inspire you to get your nails done or even be creative with some DIY action. Get your nails did and sip some delicious drinks at the pool or on the beach! Nothing more freshing for the summertime than adding various fun colors to your nails. These nails do just that. You will see various colors but the main colors that stand out from the crowd are light blue and yellow. The unique artwork on the one nail and the bedazzled treatment on the other makes these perfect for the summer. We love the “wet” look and these nails above nailed it. Literally! If this girl told us she opened up a can of paint and dipped her nails inside of it then took this picture, I’d legit believe it. This is so pretty and perfect for the summer. Ships Ahoy matey! These nails are so perfect for your next boat trip or if you are lucky enough to go yachting. The blue and white stripes along with the solid blue and white nails look great. Not to mention the very pretty boat anchor with the rope too. Very creative! Chevron baby! Look at the fun pink and green neon nail polish used here. I really love the split she used with the slate grey to break up the fun colors. I also love the imperfection with the crispness of the lines which is something we appreciate. DIY action girlfriend! It doesn’t matter what you are doing but if you combine pineapples and aloha, you have summertime fun. These nails look almost too perfect. The pineapple is gorgeous and the yellow nails with the black aloha printed on them looks fabulous. It’s summertime ladies! You need to make sure your toes are on point. These toes above look perfect. These are like toes of the bride perfect. The white color is very vibrant and the luxurious style on the big toes is gorgeous. Perfect for cute sandals or open toed heels. Yellow is the main summer color. You think of warmth and more importantly you think of the sun. Above you will see yellow being used as the main color here and the gold speckles are a great touch to break up the flat yellow. I’m not sure what the word for this is, but these colors in combination just reek of the summer season. We have bright, neon pink and bright neon green/yellow. Now you add silver sequins to the mix and you have perfection. This is the ideal summer manicure! You can’t have summer without palm trees. Whether you are on vacation at a warm destination or you luckily live by palm trees all year round, these nails speak to all of us. The white color on the nails is beautiful and the black palm tree on top is the best contrast you could ever hope for. This girl seems to be cheating with this one because she took the picture in front of what looks like an aquarium of some sorts but we will take it. Look at all the fun summer items. We see stripes, pineapples and flamingos. It doesn’t get much better than that for a summer time mani. Starfish and seahorses? Did we just become best friends? The starfish and seahorses are amazing. I would imagine this girl used a nail stamper to accomplish this which is a neat little trick to get perfection like you are looking at above. The pink and blue ombre style is an added bonus. Sometimes when we see nails here at BestNailArt.com, we see true works of art. This is one of those occasions where this is literally art and the easel is the nails. Here we have a beautiful sunset that is happening behind two palm trees that appear to be blowing in the wind. How amazing that she pulled this off? Unreal. French tips seem to be the way to go when you don’t know which way to go. French tips are the number one way to make your nails pretty every single time. These french tips offer more color on the tip and more bedazzle throughout. Very cute! We know this is a best summer nails theme, and these nails could pass as otherwise but we wanted to include them anyways. We loved the flowers over a dark background. These nails are great for late night summer parties or for when the air is a bit more breezy that usual. Very nicely done. Now these are summer to the T. You have the beautiful soft yellow nail polish and then you have some fun characteristics on top. For instance, you will notice the also yellow polka dots which seems to be a darker shade. Then you have colorful flower petals to make these nails complete. Hand me a rose darling. Or make your hand a rose, darling? Any who, these nails are extremely pretty. The red, white and black colors make these perfect. I love the black outline around the rose petals and stacking it over white offer the ultimate contrast. How pretty are these nails? You have sort of a rainbow effect that nails all the summer time colors. I see orange, green, yellow, white and pink all combined to make a great summer manicure. The speckled polka dots on top of each nail are very neat. Wow! We are in love with this particular shade of pink polish. You can clearly see the creme colored pink lacquer bottle in the image so if you like what you see you should buy it. The flower petals are very summer time. Yellow and pineapples? Sign me up! When you want to chill at the pool or the beach this summer imagine having these nails. You can take the perfect drink in hand selfie and show it all off at once girl. I know what you are thinking. These nails do look like Easter eggs. We get it. However, we agreed that these nails are perfectly suited for the summer time too. The almond shaped acrylics are perfect and all of these soft shades can pass for the summer. Ladies, trust us. Looking for something more simplistic? Look no further! These nails are an adorable soft shade of pink that makes my heart smile. These are so beautiful and nothing short of gorgeous. The nice thing about these nails is the fact that they can be worn alongside any outfit. These nails are incredibly pretty and we had to include them. The neutral color of polish that takes up the entirety is so beautiful. Now add the flowers on the tips and you have a summer time french tip manicure with a twist. These nails are so cool! The orange nails are vibrant and the stylish nails offer a great artistic take. If you want to stand out this summer, then get your nails looking like these sweet things. We noticed the china glaze bottle right away. China Glaze is some of the best nail polish on the market. We love this particular color by china glaze also. To add the little tiny sparkles offers the perfect cuteness. Your nails will appreciate this more than your friends. Now we notice pineapples as a theme here for summer nails which we wouldn’t want any other way. However, none of the nails looked like a real pineapple. Well, until now. These nails are gorgeous. The one nail along with the rest makes this legit look like a juicy summer time pineapple treat. Very impressed! We love simplicity which you will notice when visiting our website. Here is a case where these neon, almost glow in the dark, pink nails are a basic display but show off the color for what it’s worth. Nothing complicated here, just amazing nails. Pink is a color that works all year round and depending on the shade, can work with any outfit or occasion. Here we have mostly pink with cute little flowers on top. The little bit of white polish really offers a nice touch. Here we have the best of both worlds which by that we mean you get the toes and the fingernails. First off, the polish color choice on the toes is the best pick for wearing slides. That color just pops and people will instantly look down at your cool footwear. It’s just impossible not to notice. Then, your fingers feature this natural nail color to an ombre like pink transition making this a great combination. It’s a bunch of pretty flowers! So cute! The half flower style on top of this darker pink color makes this a unique display. It actually made us smile when we looked at this one. How did we get this far into this and are only mentioning cactuses now? Look at how awesome these nails are! 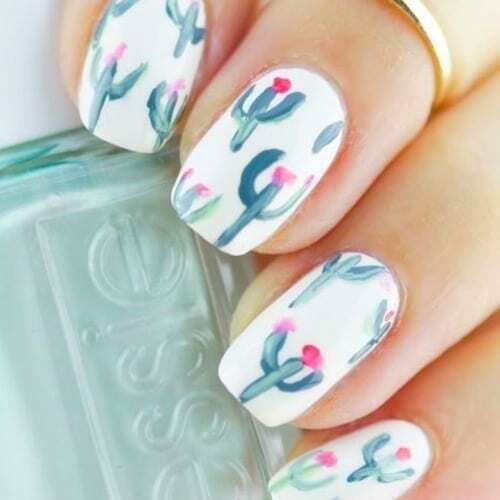 The “sloppy” hand drawn cactuses on top of the perfect white polish makes the cactus look even better in our opinion. Now these are perfect for the desert heat summer! Yay! More starfishes! I like the orange color of polish on four of the nails, then you get the cute light blue polish with starfishes on the final fifth nail. This is a very cute pick for your next aquatic vacation. Why did I think of a mermaid the second I saw these nails? Is that normal? Regardless, these nails are on point. This is a professional nail artists at work here and there is no doubt about that. The gold glitter, the pink, the blue, the marbling effect below the clams and other accents? This is just so busy yet so organized. It’s amazing really. Yellow, yellow and yelllllllow! Bonita Salon Yellow Nail Polish is the main color being used here and it is ridiculously pretty. The added assortment of colorful flower petals on top of the yellow lacquer looks amazing for the summer. It’s like sticking your hand inside a garden of amazingness. These nails above really scream summertime. I mean, let’s be honest here. This was an easy choice for the best summer nails list. You have the cute pink color, the cute white and black stripes and the amazing, adorable and incredible aloha printed on top of a white nail where you also see two pretty palm trees. This is something spectacular. These may just be the prettiest toes we have ever seen. This girl has some great feet and her toes look amazing with this soft shade of mint green. The big toes are what really screams summer to us You can tell this is professionally done and we are very impressed. Make your feet this cute for the summer and you can take more toes in the sand pics for instagram.